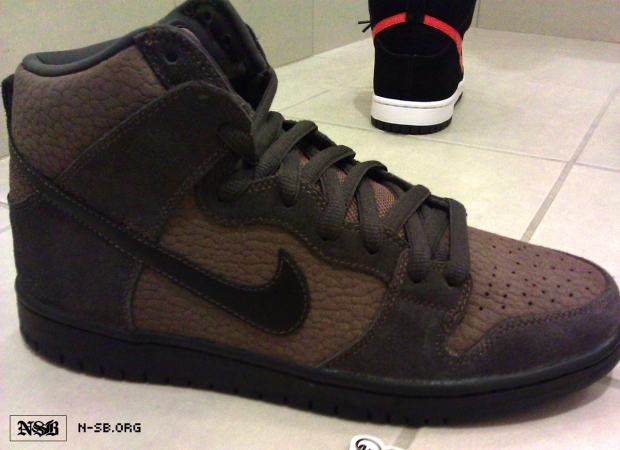 Pebbled leather takes over this upcoming Nike SB Dunk High. Set to release this holiday season. Giving us a look at yet another unique variation of the SB Dunk High, new images have surfaced of this pebbled leather edition for the holiday season. Staying away from all the flashy colors and relying on it's materials, this latest pair works with a predominantly brown upper, with a pebbled leather filling in the toebox, underlays and ankle area. Suede takes place in all the right areas, working along the toe, eyelets, Swoosh and heel. Get a look at them below, and look for them to arrive at your local Nike SB retailer this holiday season.